2016 - a new Melodist CD! 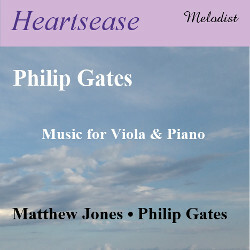 Matthew Jones plays the nostalgic, luminous music for viola and piano by Philip Gates. Two impassioned sonatas for viola and piano flank ‘Pipedream’ and ‘Prayer Meeting’, a pair of mood pictures inspired respectively by Scottish folk song and gospel music. This new CD is available to purchase both here and at the Philip Gates homepage.